A swinging chair sold exclusively at Pier 1 Imports is being recalled after causing nearly 30 injuries. The Swingasan chairs and stands was sold at the store and online from 2010 to 2015. Since they went on sale, there have been hundreds of reports of the chair and stand tipping over, and multiple incidents of chairs falling when suspended from other hardware. 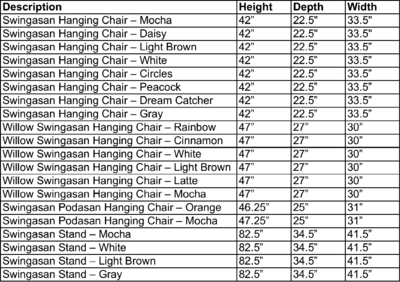 For a complete list of the chairs that are being recalled, check the chart below. Owners of these chairs should stop using them immediately and contact Pier 1 Imports for a full refund or a repair kit.